Definitely a happening place. For Dine LA week, we decided to try this restaurant out and I am really glad that we did. You got to love the price, $34 for a 3-course prefix meal. The decor is very nice, a little dark but it could be very romantic if it weren't so loud. When we went it was extremely crowded, but we made reservations so they sat us immediately. We sat at a corner table where we all squeezed in to sit on the booth, laced with decorative pillows, since no one wanted to sit on the chairs. For the first course, we all ordered the Lobster Ravioli. 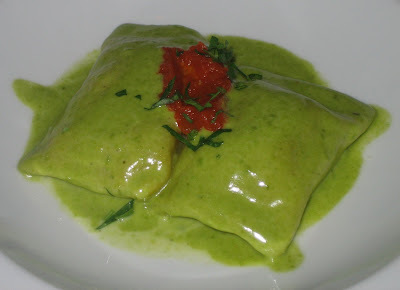 It was prepared in a basil pesto cream sauce. All in all it was only alright but you definitely can taste the chunks of lobster. Another reason I think it wasn't as tasty was because I opted for the seared Foie Gras. How could I not! It was prepared with a Black Truffle Mac & Fontana Cheese with bacon, mushrooms, and there were a lot of shaved truffles under the foie gras. You are surrounded with the luxurious aroma of black truffles when they bring the dish out. I let my friends try the truffled mac & cheese, and they ended up splitting an order later on. It was just that good! Based on that dish alone, it won me over. I know it wasn't on the special priced menu but it was worth the $19. The only thing bad I have to say about this dish is that there are too many delectable items fighting for my taste buds. 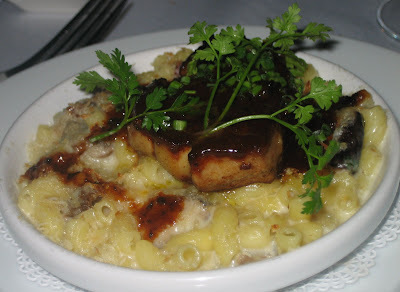 I think the dish would have been better if they were separate because the foie gras was flavorful by itself and so was the mac & cheese. Once you eat them together they both are trying to over power each other and you don't get to truly enjoy the divine qualities of each dish. Based on this dish you can tell they must have pretty decent food overall, so I will definitely return to this place in the future. To ensure that we would be able to try more menu items, my friend and I agreed to share the entree. We ordered the Pan-roasted New Zealand White Sea Bass and the Slow Braised Short Rib with Champignon Truffle Oil Risotto. Lets just say it was a truffle filled night and you can never go wrong with that! 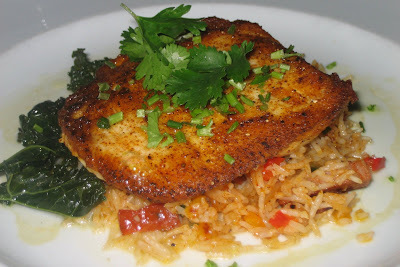 The sea bass was prepared nicely atop a medley of rice. The flavor was nice but not very powerful. I think we all wanted something stronger in flavor since the truffled dishes were so delectable and flavorful. 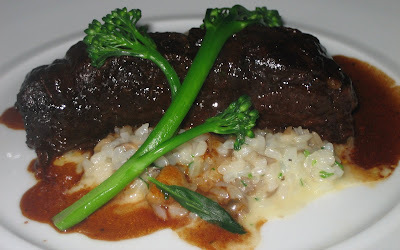 My friend loved the short rib and definitely loved the risotto. I don't think I am a huge short rib fan. I do not like cooked meat but the meat was very nicely done. You can easily pull it apart and it was fatty, not too fatty, enough for it to melt in your mouth. What can I say about the risotto, it MADE the dish! I don't think the meat was by itself very flavorful but once you accompanied it with the risotto it just brought out all the flavors inside the mouth. Based on this, when I come back I will definitely order dishes with truffle in it because they really know how to utilize the flavors. As for the dessert I ordered the Chocolate Ice Cream Sandwich, it was good but nothing that I would ever crave or order by myself. 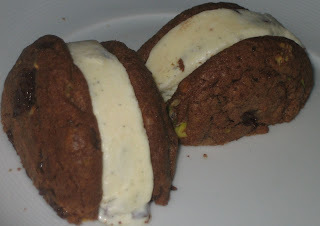 The one thing I like about the cookie is that it had pistachios in it. One of my friends decided on the M-Lato. They actually ended up bringing the wrong flavor so we actually got to try two flavors as they quickly brought out the correct flavor and apologized for the mistake. 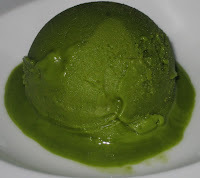 We tried the Macha and Banana & Walnut gelato. Maybe I just don't like macha, but I thought it was only alright. I liked the banana & walnut flavor more, but both were only alright to me. My favorite place is in Paris, oh how I miss Paris! Thanks to your review we had a great dinner there tonight! The menu has changed, but they still had a chicken dish with a truffle risotto--Yum! We went early and it was Super Bowl day, so thankfully it was fairly quiet! I think that they do an excellent job! Thanks for visiting Compucook! Oooh they had another truffle risotto dish. Sounds delicious! ^_^ I am glad you had a great time and that it was not too loud since it's Super Bowl Sunday.